Unlike the northern polar cap, the southern ice cap stands on heavily cratered ground in the southern highlands. It is elevated about 6 km (4 mi) higher than Martian "sea level," which is the average radius of Mars The southern also covers part of the ancient Prometheus impact basin. The polar cap has a thickness similar to the northern one — about 3,000 m (10,000 ft) — but it spreads only about 400 km (250 mi) wide. The cap's highest point lies at –87° latitude and 0° longitude, not the actual pole (–90°) but about 180 km (112 mi) away from it. Polar materials also extend hundreds of kilometers toward the equator in a direction centered on 150° east longitude. Why this displacement? Scientists think it was caused by winds being influenced by the deep Hellas impact basin, which has existed for nearly all of Mars' history. The winds could steer high- and low-pressure waves in the atmosphere and cause CO2 snow to fall more heavily on one side of the pole. Like the north, the edge of the south polar cap is chopped by canyons. A large canyon named Chasma Australe cuts into Planum Australe with dimensions similar to Chasma Boreale in the north — about 500 km (300 miles) long and 80 km (50 mi) wide. 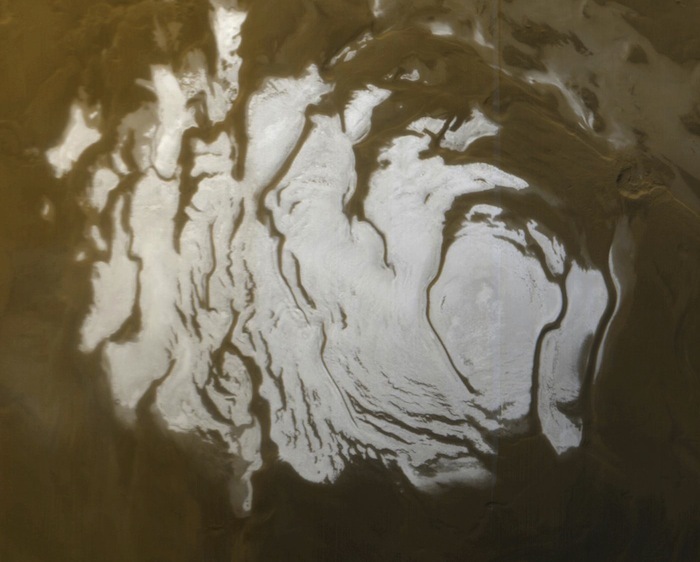 But the southern ice cap also contains several other large canyons such as Promethei Chasma and Ultimum Chasma. In the north, the smooth lowland plains underlie the entire cap. But MARSIS radar probes of the southern cap show an irregular surface underneath, with several large depressions, presumably impact craters. At the bottom of southern cap, the lowest layer is the Dorsa Argentea Formation. This unit, some 600 to 900 m (2,000 to 3,000 ft) thick, spreads hundreds of kilometers beyond the edge of the ice cap. The formation takes its name from the sinuous ridges (the dorsa) that cross its surface. These may be eskers, winding ridges of sand and gravel left by streams that flowed beneath a now-vanished glacier. Other features may be left by subglacial volcanoes. According to scientists, the Dorsa Argentea Formation may be the remnant of a polar ice sheet, billions of years old, which has lost much of its water ice. It is a relic that likely formed under a different climate than today's. The bulk of the southern cap lies in its polar layered deposits, the next higher and younger unit. Added to the northern polar layered deposits, the total would be similar to the Greenland ice cap on Earth. The southern polar layered deposits are mostly water ice mixed with dust. Where the layers' edges are exposed in canyons, they show deformations, pinch-outs, and patterns of layers, similar to those in the northern ice cap. Still, there are differences. Layers in the southern cap appear thicker: several meters (yards) thick, as opposed to several feet thick in the north. Southern layers also tend to form terraces, while in the north's canyon walls appear smoother. The canyons cutting into the cap's edge apparently form in the same way as those in the north, with strong influence from winds blowing off the ice cap. A new southern discovery has come from the SHARAD radar: it identified a large body of CO2 ice embedded within the water ice layers. The CO2 ice body has a volume about that of Lake Superior, scientists say. If it were turned into gas, researchers note that it would about double the density of today's entire Martian atmosphere. The southern polar layered deposits appear markedly older than those in the north, based on counting impact craters. Estimates range from 10 to 100 million years. Research attempting to link the visible layers to orbital changes has not been very successful, and this is a topic for active research. The southern residual ice cap is made of water ice. But because the southern cap experiences colder temperatures due to its higher elevation and longer winters (compared to the north), it is covered by a thin layer of CO2 ice, 5 to 10 meters (yards) thick. 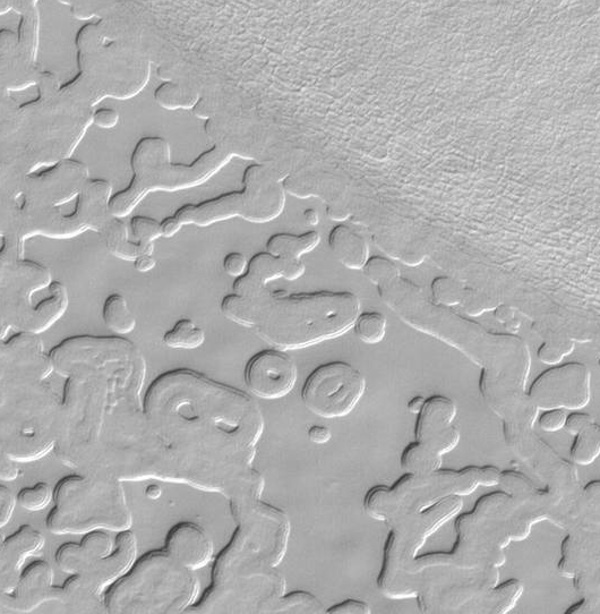 This CO2 ice layer erodes into what scientists call "Swiss cheese features." HiRISE images show flat-floored, mostly circular pits and linear ridges. The pits range in size and shape. Thicker CO2 ice slabs have eroded into stand-alone mesas. Observations show that the pit walls retreat by several meters (yards) each Martian year. Pits in thick slabs expand faster — 8 to 10 meters (yards) each Martian year) than pits in thin slabs. Researchers have proposed that the southern residual cap can erode and grow back on time scales of about 60 Martian years or roughly 115 Earth years. Finally, on top of the residual cap a seasonal ice cap comes and goes each Martian year. Made of CO2 ice, it blankets the southern hemisphere from the pole down to about –50° latitude. It is centered on the geographic pole (90° south). In places this layer undergoes a remarkable phenomenon not seen on Earth. Over the winter, the blanket of CO2 frost and snow changes into a slab of solid, transparent CO2 ice. When spring arrives, sunlight passes through the slab to reach dark material (sand and dust) below. This warms the dark material enough that the bottom layer of ice begins to sublimate. As days pass and the Sun rises higher, sublimation continues. Before long, the warming creates a reservoir of pressurized CO2 gas under the slab of ice, lifting it. Eventually, weak spots in the slab break through, making vents that are 15 to 50 meters (yards) wide. High-pressure gas roars out of the vents at speeds of 150 km/hour (90 mi/hour) or more. Under the slab, the gas erodes the surface as it rushes toward the vents. The gas also snatches up loose particles of sand and dust and carves networks of grooves called "spiders" that converge on the vents. As they erupt, the jets carry loose sand and particles a few hundred meters (yards) into the air. The largest and heaviest particles fall closest to the vent, piling up around it to make dark spots. When lighter sand grains tossed out by the jet are blown downwind, they create dark fans, which can extend tens to hundreds of meters (yards) from the vent. The lightest particles, meanwhile, drift away on the wind to form a thin layer of dust. Once the slab of seasonal CO2 ice has entirely sublimated, the jets stop and the show is over until next spring.